40. In order to confirm, as required by the Safeguards Agreement, that all nuclear material in Iran is in peaceful activities, the Agency needs to have confidence in the absence of possible military dimensions to Iran’s nuclear programme. 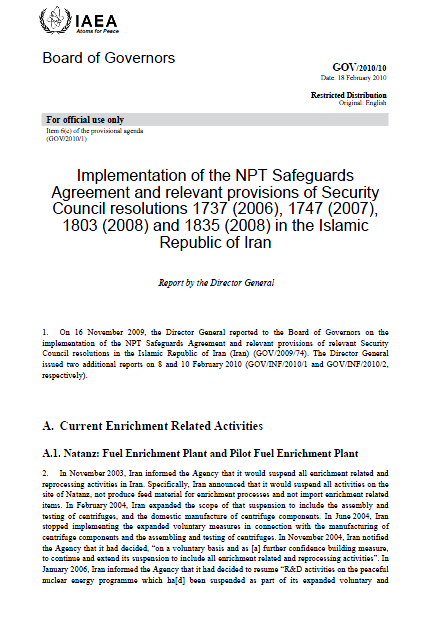 Previous reports by the Director General have detailed the outstanding issues and the actions required of Iran,12 including, inter alia, that Iran implement the Additional Protocol and provide the Agency with the information and access necessary to: resolve questions related to the alleged studies; clarify the circumstances of the acquisition of the uranium metal document; clarify procurement and R&D activities of military related institutes and companies that could be nuclear related; and clarify the production of nuclear related equipment and components by companies belonging to the defence industries. 41. The information available to the Agency in connection with these outstanding issues is extensive and has been collected from a variety of sources over time. It is also broadly consistent and credible in terms of the technical detail, the time frame in which the activities were conducted and the people and organizations involved. Altogether, this raises concerns about the possible existence in Iran of past or current undisclosed activities related to the development of a nuclear payload for a missile. These alleged activities consist of a number of projects and sub-projects, covering nuclear and missile related aspects, run by military related organizations. organizations in Iran to obtain nuclear related technology and equipment. that the information to which the Agency is referring is based on forgeries. connection with questions about military related dimensions. PFEP in February 2006; FEP was put into operation in February 2007.
centrifuges in Production Hall B.
such inspections since March 2007.
cascade, a 20-machine IR-2m cascade and single IR-1, IR-2, IR-2m and IR-4 centrifuges at PFEP. Iran is in peaceful activities. companies involved in the design and construction of the plant. been provided with access to the Heavy Water Production Plant. 51. The Director General will continue to report as appropriate.